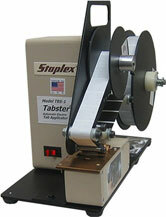 The Tabster® applies self-adhesive Perf-tab wafers to close mail pieces, tamper-evident flat packs, CDs, DVDs, pharmaceutical samples and more! as quickly as work is inserted. The Tabster 1.5® meets new postal regulations and applies self-adhesive Perf-tab wafers to close mail pieces, tamper-evident flat packs, CDs, DVDs, pharmaceutical samples and more! as quickly as work is inserted. 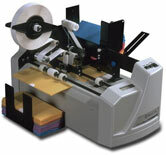 The Martin Yale® EX5100 tabs documents of many varieties at a speed of up to 7,500 pieces per hour. Key features include extremely quiet operation, permanent batch counter and electronic adjustment of tab location for equal centering.